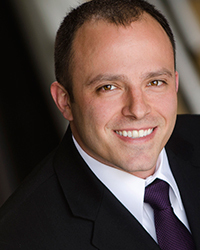 Home - Volpe Law Firm, P.C. while saving you time and money in the process. We tailor an overall strategy custom to your needs and then handle all necessary immigration filings. We provide complete training to prevent problems rather than respond to them. We monitor international travel constantly to detect and correct government errors immediately. We provide a custom encrypted online dashboard so you can see your whole program clearly. religious immigration have moved from your desk to ours. We represent Catholic dioceses and religious orders throughout the United States. 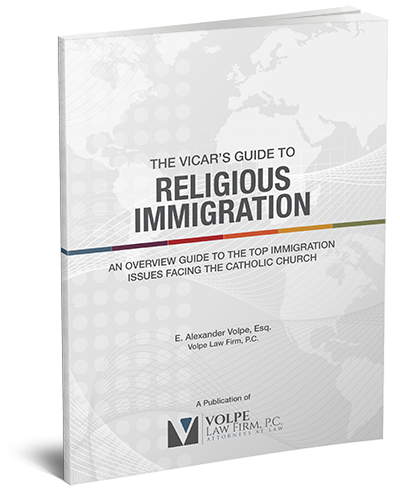 Many have the same questions, which is why we put together the Vicar's Guide to Religious Immigration. Whether To Apply For R-1 During Deaconate Or Wait For Presbyterate? Should We List Our Diocese Or A Parish As The Employer? When Can My Workers Travel When A Petition Is Pending? Should I Be Requesting Vocational Or Occupational Visas For My Workers? How Can I Skip R-1 Status And Get A Green Card For My Workers? Enter your information here to receive your complimentary copy. The legal landscape affecting religious immigration changes constantly. 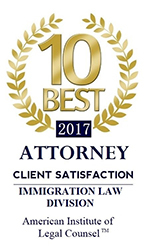 We keep you informed and up-to-date on what matters most, such as the constant expiration of the non-minister religious worker visa program and change in availability of green cards for religious workers. Enter your information below to receive important updates on the laws affecting religious immigration. Do you have questions about a specific situation? We are happy to provide a no-obligation one-hour consultation to answer any questions you may have. We can discuss questions about a specific case or general questions about your religious immigration program. Enter your information below to request a consultation. We will respond within 24 hours to schedule your consultation. Like all religious organizations, you know that bringing in foreign seminarians, clergy, religious vocations and lay personnel is critical to your ability to minister and evangelize. However, managing the immigration status of multiple religious workers is cumbersome and mismanagement of immigration processes can create a logistics nightmare. In today’s immigration environment, religious organizations can no longer risk working with law firms that only dabble, if at all, in religious immigration. Additionally, filing legal papers is no longer enough. The religious community requires greater specialization, dedication and expertise to safeguard the rights of its religious workers and achieve its immigration objectives. Volpe Law Firm exists to support the Church in both the legal and management aspects of religious immigration. Additionally, we offer custom pricing options so you can save time and money throughout the process. Contact us today to see how our many religious immigration services can provide you the peace of mind you need to focus on your ministry. Our office is open from 9:00 A.M. to 5:00 P.M. MST Monday through Friday. It is our policy to return any emails or phone calls within 1 business day.